Revelstoke, BC is located on the banks of the Columbia and the Illecillewaet Rivers in the northwest Kootenay region of British Columbia, Canada. The community is a four season recreation and adventure gateway surrounded by the Selkirk and Monashee Mountain Ranges, Revelstoke and Arrow Lakes, and some national, provincial and community parks. Excited to be here in Revelstoke, BC! 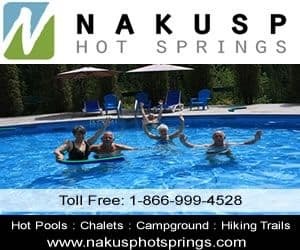 Activities most enjoyed in Revelstoke, BC and throughout the surrounding areas includes golfing, camping, paddleboarding (SUP), flightseeing, swimming, mountain biking, boating, fishing, rafting, kayaking, backpacking, heli skiing, skiing, snowboarding, snowshoeing, and dog sledding. A few of the more popular activity and sightseeing destinations in the region include the Martha Creek Provincial Park, Revelstoke River Pathway, Mount Revelstoke National Park, Begbie Creek Trail, Begbie Falls Trail, Echo Lake, Revelstoke Lake, Mt. Cartier Trail, Mount Macpherson Trails, Upper Arrow Lake, and Glacier National Park. Some of the attractions, historic sites and cultural venues to visit in and around Revelstoke, BC include Nels Nelsen Ski Jump, 3 Valley Gap Heritage Ghost Town, Revelstoke Museum & Archives, Revelstoke Railway Museum, Revelstoke Dam Visitor Centre, Grizzly Plaza, The Last Spike, Revelstoke Court House (1912) and the Presbyterian Church (1905). Services in and around the community of Revelstoke, BC include accommodations, tours, guides, restaurants, grocery stores, gas stations, banks, cell service, internet, gift shops, post office, coffee houses, pubs, liquor stores, and transportation services including bus, and taxi.